Four Scottish companies are among 10 major UK caterers who have committed to an innovative new initiative aimed at increasing vegetable consumption within their businesses. Albacore, CEC Catering, BaxterStorey at City of Glasgow College and Dynamic Earth Enterprises have joined Peas Please to deliver additional portions of vegetables to customers. The four companies are unveiling their commitment today alongside Sodexo, BaxterStorey and Interserve who made pledges in 2017. Collectively feeding over 100,000 people each year, the Scottish outfits are all committing to substantially increasing the quantity of veg they serve. Coordinated by partner organisations in each of the four UK nations, Peas Please aims to bring together companies and brands to make it easier for people to eat vegetables. Businesses are invited to make commitments for how they will help us all eat more veg. With an estimated three in four adults failing to consume the recommended minimum five portions of fruit and vegetables each day, strong inequalities between different levels of income have become apparent. Those on lowest incomes eat a whole portion less than those on the highest and yet, for every one of your five-a-day eaten, the risk of premature death decreases by five per cent. Of the four most recent Scottish signatories, BaxterStorey Scotland at City of Glasgow College have pledged to serve 20% more vegetables to the 5,000 students they cater for on a daily basis. They will also try to inspire students to eat more vegetables through pop-up stands, targeted events and so-called ‘veg days’ held throughout the academic year. Other new pledgers in Scotland include the Chefs@School programme, who pledged to reach 6,000 children with new veg-focused educational resources, along with football centre chain GOALS. 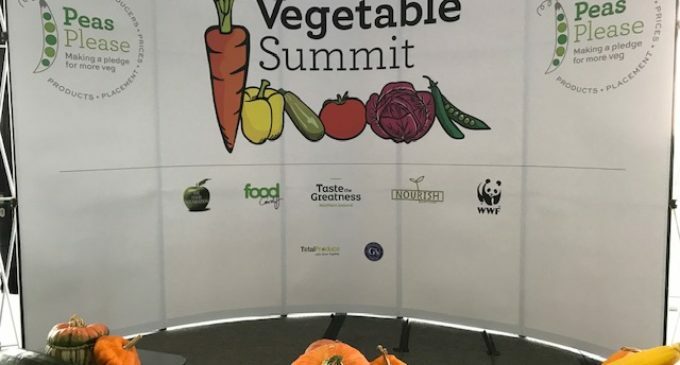 London City Hall plays host to the Vegetable Summit 2018 today, 8th October.